What a wonderful summer it has been and less than a week till autumn is officially here ! The last of the gardens bounties are being harvested and preserved; the bed have been upturned and once the tomatoes have exhuasted themselves of production it will all be tilled limed and covered with straw and leaves for next season... I have planted a few kale seedlings, with the intention of seeing just how well my coldframe will retain the heat the sun will possess as the winter looms on the horizon. 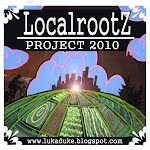 Cassi and I have been enjoying cooking with the abdundant resources provided from our gardens as well as the great local farms that share their goods a few times a week at the local farmers market... below you will find some highlights of the last few weeks of the LocalrootZ Project ! Our hot pepper harvest from the rooftop garden... Cayenne, Thai hots, jalapeno and a sweet red which variety is escaping me at the moment ! With the first pie pumpkins making their way onto the scene it seemed only appropriate to whipp up a apple pumkin crisp for our local dessert of the week! Its quite simple... just halve the pumpkin and scrape the seeds and guts into a strainer, save the seeds and roast them for a nice garnish or snack. Bake the pumpkins till flesh becomes soft enough to scoop from the skin. Scoop the flesh into a mixing bowl and beat with 2 eggs and a 1/4 cup of yogurt... sweeten to taste using honey/maple syrup or a combination of the two... pour this mixture over a casserole dish of raw peeled and sliced apples... top with a butter/oat/honey mixture and bake at 375˚ for 30-45 minutes. And there you have it... I will do a step by step photo presentation on this recipe in the future because this is a classic stand bye for a local dessert as we head into the colder months ! On a Monday Cassi and I decided with all these tomatoes and sauces that we had to make some pasta for the coming week... away we went rolling and combining Sparrow Farm eggs with Aroostook county stoneground whole wheat flour... I found sifting it helps pull out some of the grittier pieces in the flour. We choose to roll it and cut it as fettucine because it holds its shape better under storage... spaghetti tends to crumble after a few days in the fridge. with the remainder of the pasta Cassi pleaded for a homemade mac n cheese with the fettuccine being the mac and the cheese being a sauce consisting of raw goat milk, swallowtail butter with a block of manchego and some other local cheese ends kicking around the fridge... topped with some Mother oven bread crumbs...yes I still have 2 and a half loaves of that legendary bread ! It made a wonderful dish that lasted us well through the end of our week. the sauce simmers for a couple hours before completion. so many hot peppers I had to start drying some out. some wonderful goodies including brussel sprouts ! mmm apple cider is back on the scene also ! so much corn on the cob, poblano peppers and sungold tomatoes turned into a wonderful meal. The peppers are stuffed with browned local tempeh, various local cheeses and corn. We don't make a habit of eating swordfish but when its caught locally of the coast of Maine and the price is right we will splurge for a couple servings a year... so good with a side of brussel sprouts ! Curried Cauliflower and swordfish with spicy poblano tomato sauce and fresh cilantro... so good !